» Final Lore » Geography & Political » Maoi Island. 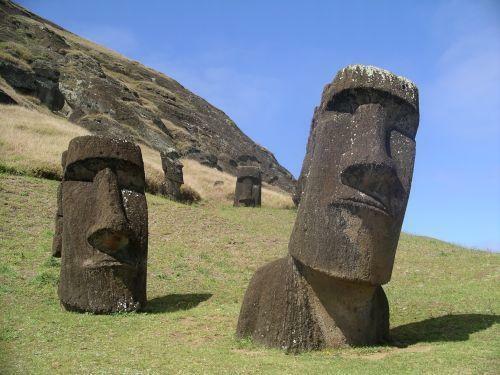 I think we definitly need an easter island style island, you know the ones with those heads. and maybe a special race of indigenous pygmies or something, just like the ones in pocket god. Anyway, I can't really thing of a name for this island but I think an exotic island somewhere would be really nice, it would allow people to explore and maybe gain something rare aswell. It needs to be really humid and green, it could have cannibals and other scary animals on it and some unfriendly islanders. That would be interesting however the problem would be that once someone does the quest no-one else can do the quest, maybe it could be worked in though. Vote yes or no please. Wow - five yes's, pretty populor then. I think this is going to be in the final game then . Just so everyone knows this also goes with Bunnays area idea, there will be no technology on this island but technology can be brought on. Theres also voodoo, but the hollywood evil version. Not the real stuff. Not nessesarily. It could be a multiple-quest storyline, and, and then anything that changes in the world at large once the quest chain is over could be incorporated, making it more than just persistent, but 'living' per se. I can totally agree with that idea. The tribes would always be having problems that could start as mundane little things (He stole me goat, her children broke our corn stalks) and elevate VERY quickly to full scale tribal wars.